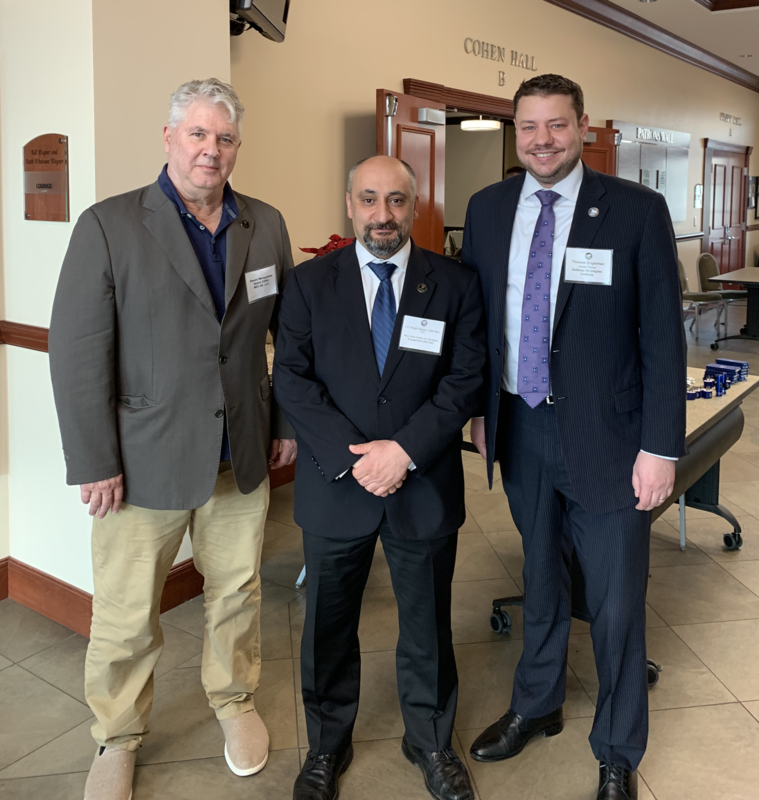 It was an honor for the Near East Center for Strategic Engagement executive team to have participated and given its input on topics and issues discussed in the December 12-13, 2018 Special Operations and Irregular Warfare Symposium held in Tampa, Florida. The Symposium was organized by the Defense Strategies Institute (DSI) as a professional educational forum and is focused on enhancing Special Operations Forces capabilities to guide operational success. Implementing the Tactical Assault Light Operator Suit (TALOS) to increase SOF readiness capabilities with the end goal being a more decisive overmatch for the enemy. The two-day event was moderated by Michael Kichman, founder of Asymmetric Operations Group. Kichman organized the symposium, working with DSI to bring together mission-relevant representatives in neutral “Town Hall” forums to foster discussion and debate aimed at helping the force to operate efficiently and effectively and achieve mission success. The keynote speaker for this years event was Owen West, Assistant Secretary of Defense for Special Operations/Low-Intensity Conflict DOD, who focused on guiding the policy and oversight of strategic capabilities and resources for special operations forces. Major General. E. John Deedrick, Jr., USA, Commanding General, 1st Special Forces Command, USASOC, spoke about facilitating operational effectiveness and expeditionary capabilities to excel in hybrid warfare and ‘gray zone’ conflicts. Lieutenant General Michael Nagata, USA, Director, Directorate of Strategic Operational Planning National Counterterrorism Center (ODNI) addressed strategic priorities to effectively combat terrorist activities. Dr. Kathleen H. Hicks, Senior Vice President, Henry A. Kissinger Chair, Director, International Security Program (CSIS), explain how ‘gray zone’ conflicts will become more frequent and complex. Lieutenant Colonel Brandon Griffin, USA, ABLE Squadron Commander Asymmetric Warfare Group, discussed guiding initiatives and strategies to achieve success in an across-domain global environment. David Soloff, Chairman, and Co-Founder, Premise Data, spoke about the implementation and employment of an intelligent global human sensor system to enhance irregular warfare capabilities. Mr. John Riordan, Deputy Development Advisor at Special Operations Command (SOCOM), Office of Civilian-Military Cooperation, USAID, looked at leveraging the relationship of development and defense to establish and maintain global security. LeAnne Howard, Strategy and Policy Advisor, NATO Special Operations Headquarters, focused on NATO SOF Headquarters and the legacy and future of NATO SOF. Dr. Jonathan Schroden, Director, Special Operations Program, Center for Naval Analyses, looked into the objective analysis of the critical role of SOF in global competition. Rear Admiral Hugh W. Howard, USN, Commander SOCCENT, focused on the Special Operations Command Central initiatives towards enabling SOF capabilities in support of regional stability and U.S. national interests. A panel moderated by Mr. Howard Strahan, Deputy Director, Science and Technology (S&T), SOF AT&L, with a panel consisting of Colonel David Phillips, USA, Program Executive Office (PEO) Rotary Wing, SOF AT&L, Colonel Joel Babbitt, USA, PEO SOF Warrior, SOF AT&L, Colonel James D. Miller, USA, Director, TALOS Program, SOF AT&L, and Ms. Margaret McCaskey, PEO Special Reconnaissance, Surveillance, and Exploitation SOF AT&L discussed SOF AT&L top acquisition priorities that are currently being undertaken to mitigate risk and speed up delivery of service to SOF. Daniel Kimmage, Acting Coordinator, Global Engagement Center, US Department of State, covered bolstering US control of the terrorist/counterterrorist information battlefield. Frank Sanders, head of the Sensitive Special Operations Division, Office of the Under Secretary of Defense for Intelligence, addressed policy and resources required to sufficiently enhance intelligence missions. Dr. Stephen Watts, Associate Program Director, Arroyo Center, Strategy, Doctrine, and Resources Program, RAND Corp., spoke about the effort to maintain readiness for large-scale irregular warfare. From right to left: Thomas Engelman, Senior Partner, Defense Strategies Institute, LTC Sargis Sangari, USA, (Ret. ), NEC-SE, CEO, Steven Weingartner, NEC-SE senior editor/writer.